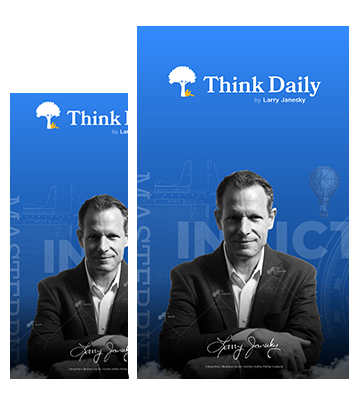 Start your day with Think Daily from Larry Janesky. His messages motivate, educate, inspire, and initiate questions that he wants you to answer. Join the 10-years going community of over 55,000 subscribers who THINK and participate each day. Who says if you are happy? You can't make other people happy. And when your own happiness depends on others being happy, you are going to be a puppet, whose strings are constantly pulled by others. The majority of us suffer from this. Don't place your happiness in others being happy. This drug will make you live longer and improve your health. Do you want it yet? Well, what if I told you it increases your memory and makes you more creative? AND, it protects you from sickness and disease, and gives you psychological relief? Do you want it yet? Well, there’s even more. This drug gives you increased self-esteem and it makes you more attractive! I know, you want to know if it’s safe? Well, there are no side effects and no one has ever been harmed by it. Is it proven you ask? Well, it has been written up in over 17,000 scientific reports as proven to provide all of the above. It only requires some self-discipline on your part to get enough of it. You can’t make other people happy. And when your own happiness depends on others being happy, you are going to be a puppet, whose strings are constantly pulled by others. The majority of us suffer from this. Don’t place your happiness in others being happy. Larry, you make a valid point here. To often we rely on others, spouse, family and friends to determine how we feel. The choices are ours and ours alone. I heard it explained this way – if you were from outer space and visited earth once every 10,000 years and gave a report each time, you’d have said “Semi-hairless apes foraging for food and resources”. You’d have given this report 23 times – for 230,000 years. The last visit however, is very different. All the change has happened recently – most of it in the last 300 years. We are made for a very different world – where there wasn’t much new information, and when there was we had better pay attention because it could mean life and death. So today, here we are swimming in available information; messages coming in at the speed of light. The Fear of Missing Out (“FOMO”), that once served to save our lives, all of a sudden is a liability. Today, FOMO = Overload and mental dysfunction. It’s a handicap we all have. People who create information know this and sell the drug this addiction feeds on. Recognize it. Set up your life so FOMO doesn’t hurt you. Replace it with FOTM – Fear Of Too Much. A survey showed 45% of 13-17-year-olds are online “nearly constantly” all day. Many of the rest of us are not far behind. While being exposed to a continuous stream of information and communication makes us more adept at finding and manipulating information via the various hardware and software channels available, it does not make us more valuable people any more than the 1970’s man who a voracious reader – of newspapers and comic books. For those that care about our own personal development, we must come to terms with the fact that we can never pay attention to a small fraction of everything out there that there is to pay attention to, and to be ok with being highly selective, paying attention to only what serves our goals. If you have been thinking in the same way about things and about yourself for some time, you probably are getting the results you are going to get as a result by now. If you don’t change your thinking and beliefs, your life will be more of the same for the rest of your time here. All changes in your results, your world, and your experience come from changing what’s inside first.